Anna Kendrick and Ben Affleck in "The Accountant." THE ACCOUNTANT is a hot mess. It’s an entertaining hot mess, but contains plot holes so huge all of a certain presidential candidate’s lies will fit in them. The leaps of faith required to accept those particular quirks are akin to believing said candidate’s lies. But like any tall tale, you don’t want to divert your attention, primarily because director Gavin O’Connor and screenwriter Bill Dubuque at very least craft a story that’s intriguing on its face which in turn allows them to generate enough tension to hold an individual’s interest. With a cast that includes Ben Affleck, Anna Kendrick, Jon Bernthal, John Lithgow and J.K. Simmons, there’s no way the film could come up short with respect to performances and they take what they have and do their due diligence with it. 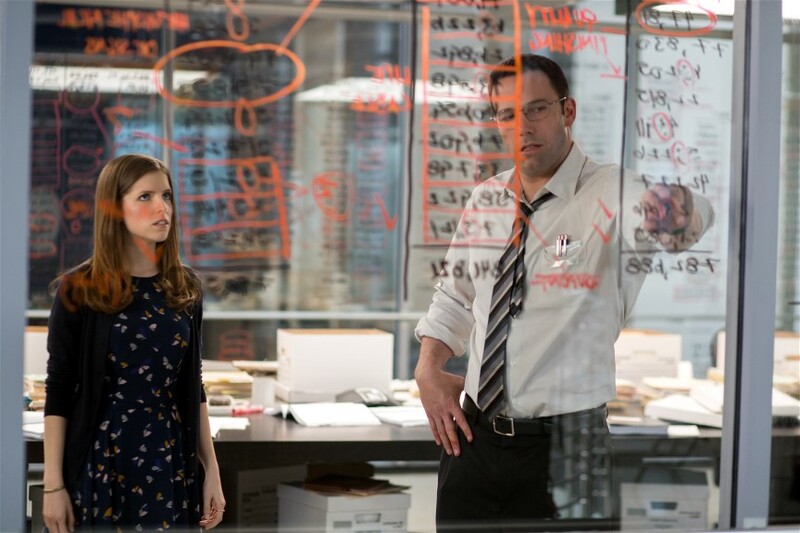 THE ACCOUNTANT tells the story of “meek and mild-mannered” accountant Christian Wolff Affleck). He operates out of a strip shopping center, he lives a modest existence. Oh, did I mention he’s autistic? Forced to confront his condition head on by his Army psy-ops father, he and his younger brother are taught to fight, to survive, and to basically not take any ISH from anyone. Wolff has taken advantage of his skills. Fast forward years and, yes, he’s an accountant, but he’s the type of accountant no IRS auditor would want to tick off. With his autism comes a gift for numbers – shocking I know –and he uses that gift to help the planets miscreants – drug and weapons dealers – and others track down money that’s been stolen from them. Dana Cummings (Kendrick) proves to be too good at her job, finding major discrepancies that are sure to get her in trouble. Right? Right. When a bean counter at a prominent bio-tech firm enlists Wolff’s services for what’s supposed to be a straight, routine gig, the two of them find themselves embroiled in something altogether different. So what makes THE ACCOUNTANT so entertaining? You can’t possibly take it seriously. It only requires complete suspension of disbelief to enjoy it, so it’s not like that’s a bad thing when viewing an escapist medium. It helps that the performances fall in line. Affleck is suitably awkward as Wolff, bringing a hint of innocence to the character’s danger. Kendrick isn’t given a lot to do except do the damsel in distress thing. Simmons and Bernthal get to have most of the fun in their respective roles as the men looking to hunt Wolff down. My advice: spend a couple of hours forgetting about life and the current state of politics.